CCCA Museum Announces 2019 "Trio of Events"
The Classic Car Club of America Museum in Hickory Corners, Michigan (a sister museum of the Lincoln Motor Car Heritage Museum & Research Center) has announced a "Trio of Grand Events" for 2019--a CCCA Grand Classic, a CCCA Museum Grand Experience and a six-day CCCA Museum Mackinac Island/Grand Hotel driving tour. On Monday, June 3, the tour will leave Hickory Corners for Mackinac Island, departing on June 6 and arriving in Hickory Corners on Saturday, June 8. Have You Renewed Your LOC Membership? Dues notices for 2019 have been emailed to LOC members with email addresses. A printed membership renewal form will be included with the December 2018 issue of The Lincoln Owners Club NewsLetter. Please send in your renewal promptly. It will save your club the added expense and time to send out a reminder. Also-- make certain that your email address is correct! Remember--send in your LOC dues renewal today! The 2018 annual AACA Fall Meet at Hershey, Pa. is history. It is the largest automobile flea market and car show in the United States. Vintage automobile enthusiasts from throughout the world descend on Hershey in search of antique automobiles and parts. Several Lincoln Owners Club members have vendor spaces in the flea market, offering Lincoln spare parts for sale. The Lincoln Owners Club holds a dinner and brief business meeting every year at the Hershey Lodge. This year, attendees came from as far away as Spain and Germany. The most engaging part of the evening is when each Lincoln Owners Club member introduces himself or herself and lists the Lincolns in their collection. It is a good evening for Lincoln enthusiasts. The Spring 2018 edition of The Lincoln Link is available at https://www.lincolncarmuseum.org/images/pdf/LincolnLink-Spring-2018.pdf. Besides including news of the Lincoln Motor Car Foundation this edition features a fascinating article on the famous Liberty V-12 motor built by the Lincoln Motor Company, which helped to bring about the end of World War I and eventually led to the creation of ta new Lincoln Motor Company to build passenger cars. There is also a fascinating look at the success of the Lincoln brand in China, including photos of retail showrooms. Future issues of The Lincoln LInk will be available only to members of the Lincoln Motor Car Foundation. Please join this important group that supports our world class automotive museum and helps to perpetuate and preserve the Lincoln brand. the 50th anniversary of the Lincoln-Zephyr Owners Club. The meet featured two distinct venues - northern Indiana and the Lincoln museum. The northern Indiana portion was organized by the LZOC to recognize the 50th anniversary of the club. 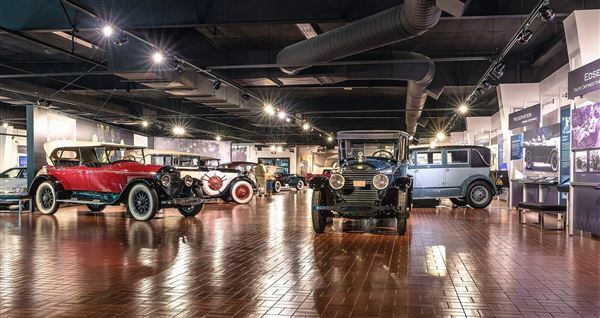 A number of special tours were held, including a visit to the Auburn Cord Duesenberg Automobile Museum. The big event at Hickory Corners featured a fine display of Lincoln-Zephyrs and early Continentals in addition to the usual gathering of Lincolns, from 1929 to 2018. Two dinners were held. On Friday evening, an entertaining live auction was held. On Saturday evening, dinner was held at the Gilmore Conference Center. Following dinner, a spontaneous fund-raising event secured more than $41,000 for the LMCF endowment fund. During the Homecoming the museum unveiled three new additions: the original 1922 Lincoln camp car used by Henry Ford, and the Vagabonds--Thomas Edison, Harvey Firestone Sr. and John Burroughs--in the 1920s, from the collections of The Henry Ford; an original, unrestored 1954 Lincoln Capri from the original family; and the clay model and prototype of the 2018 Lincoln Continental, from the Lincoln Styling Studios. All four Lincoln clubs, including the Lincoln Owners Club, have joined with the Lincoln Motor Car Foundation to create the Legacy Society to recognize those who make provisions to provide support to the Lincoln Museum through bequests. Our beautiful museum, built and paid for by members of our club as well as the Lincoln and Continental Owners Club, the Lincoln Zephyr Owners Club, and the Lincoln Road Race Register have endorsed the effort by the Lincoln Motor Car Foundation to continue fund raising efforts to maintain our Museum. Our museum is completely paid for and we've raised over half of our goal of providing an endowment of $1.5M for the ongoing maintenance of the museum. Please click on the "Documents" tab to the left to find and read the invitation from the Lincoln Motor Car Foundation President, David Schultz to join the Legacy Society. The 2018 printed edition of our LOC membership roster has been produced. We strive to make the information as accurate as possible. However, every time we produce a roster we receive complaints that it contains inaccurate information. More often, the problem is with the information we receive from members! Please be certain that we have your current address, telephone number(s) and email address. And, equally important, make sure we have accurate information on your Lincolns. Here is how to describe your Lincoln: 1931 Lincoln type 214 convertible sedan by Dietrich. And, include the serial number. That helps all of us keep track of these special cars. Here's how to do it: Log into your account with your user name and password. If you have forgotten it, the user name can be sent to the email that you have on file. Then check to see if all the information in your profile is correct. If all else fails, contact the LOC membership chairman directly by clicking on Rick Parker and ask that he assist you. He'll be glad to do so. Fork & Blade Editor Greg Bilpuch has created for us an index of more than1,400 photos printed in The Fork and Blade from 1995 through 2012. You can search for any year and body style from this Excel spreadsheet. Click on the "Documents" tab to the left to view this index. Lincoln Owners Club web site! Please take a few moments to browse around and see what we have done. The old site was developed long ago and served us well but was very difficult to maintain. Hopefully, this is a vast improvement. Please consider joining more than 450 members from around the world who own or simply have an interest in these Classic Lincolns produced between 1920 and 1939. Membership is easy and inexpensive. Joining entitles you to receive our award-winning club magazine, The Fork and Blade, which is published four times annually. In addition, we produce a membership directory bi-annually. Additional pages on this website are available as well, including an up-to-date membership directory listing all our members and their automobiles. An annual Lincoln Homecoming is held at the Lincoln Motor Car Heritage Museum in Hickory Corners, Mich. In addition there are regional Lincoln events. Finally, you will have access to our members who are the best resource for information about the history and restoration of these fine automobiles. You can join online by clicking on "Become a Member!" using any major credit card. The site is secure so your credit card information is safe. Or, if you prefer, you can go to the "Documents" tab at the left, and navigate to the application for new membership. You can print it out and mail it with your check. If you are a member you will be able to access the Membership Directory and search for your personal information. Please check this over for accuracy. Sometimes this information becomes dated or has not been verified. You will find that you can make changes to your personal information (but not your membership expiration date). The site currently has room for only five cars per member and we have some members with more than five cars. We have retained that information and plan to add it to our site when Club Express modifies this part of their program. Some of you have second homes that you migrate to in the winter. If this is the case, you may change your address when you move. Don't forget to change it back again so that you continue to receive your Fork and Blade and other communication from us. If you have an email address, add it. Some of us are reluctant to put our addresses on the site, but I can tell you that this information is able only to be accessed by current members. We will never sell or give your membership information to outsiders without your permission.